It seems nearly everyone has something to say about Martha Stewart. Personally, I'm delighted to give her complete credit and my sincere thanks for introducing me to paper filigree via an article in her Living magazine. That was in February of 2002 and I still remember the excitement I felt as I studied the beautiful pictures of things that could be made with simple strips of paper. Perhaps I had heard the word quilling at some point in my life before that moment, but as I pored over each and every beautifully photographed picture, I knew I was determined to learn all there is to know about this fascinating art in order to be able to make my own filigree designs. Books borrowed from the library and chats with other quillers I met online via a Yahoo group further increased my knowledge. Later on, I applied to be on the Custom Quilling Design Team. I have to say that was one of the wisest moves I've ever made, as there's nothing like a newsletter deadline and a specific set of supplies each month to challenge one's creative juices. I'm delighted that the pictures and step-by-step instructions from the very article that inspired me are now available on Martha's site. Enjoy! I didn't realize it was Martha who got you started. That magazine really gave quilling a "shot in the arm". I remember Malinda Johnston (the founder and owner of Lake City Crafts at that time), tedlling me they had to hire extra people and go to a six day work week just to keep up. Martha Stewart has an incrdible following. You're right, Pat - Martha has lots of fans and I'm one for sure. I learn new things via her magazine and show so often. What a cute quilling idea! 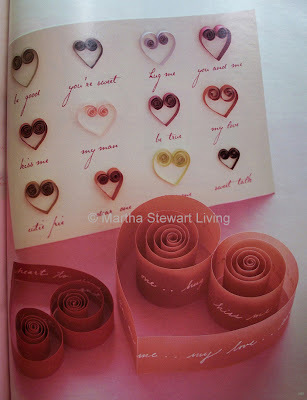 Those hearts are adorable...I love making them like that and really enjoy the paper used! This same article introduced me to quilling. I still have it in a folder somewhere! Me too, Oliviarb - it's a beauty!